Monster Honda’s Joan Barreda had to call in air support after finding himself stuck at the bottom of a basin with no way out. Barreda and his bike were helicoptered out of the area after the Spaniard came across a low visibility foggy and rocky area while opening the track, lost control of his Africa Twin which went into a slide down a ravine which it proved impossible to escape from. 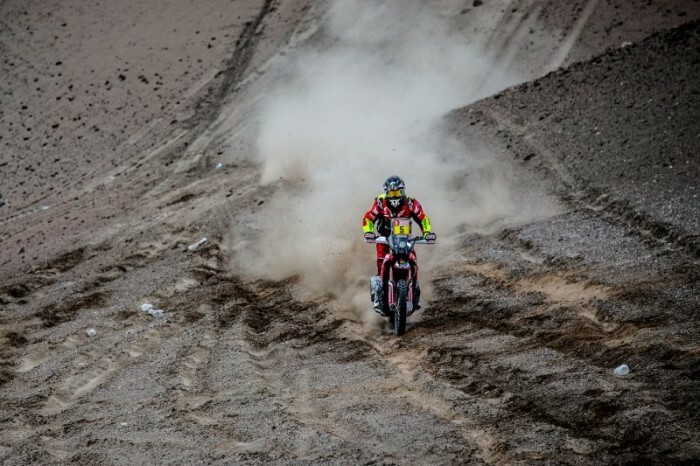 “Sadly the Dakar ended for me today. It had been going very well, opening the track and pushing the riders ahead. When I reached the mountains I found a lot of fog that limited my visibility,” said Barreda.